In a previous podcast, I talked about Australia’s wonderful beaches. While they are great places to spend time and enjoy yourself in the summer, they can also be dangerous places. The biggest danger is from drowning. Drownings at the beach have been a problem in Australia since the early 1900s. By 1905, rules had been removed which had stopped people from swimming at beaches in Sydney. Swimming at Sydney’s beaches started to become very popular. Unfortunately, some of these people were drowning. In 1907, as the number of drownings increased, some Australians at Sydney’s Bondi beach had formed a club of volunteers. They patrolled the beach and rescued those swimmers who got into trouble in the water. Today, that first club has grown into what is known in Australia as Surf Life Saving Australia. Surf Life Saving Australia is made up of 311 surf lifesaving clubs at beaches all around Australia. These clubs have around 167,000 members, all of whom are volunteers. Of these, around 46,000 are members who patrol the beaches. There are also around 63,000 child members under 13 years of age, who are learning what surf lifesaving is all about and also having a lot of fun at the same time. This is the largest volunteer group of life savers anywhere in the world. Since 1907, around 615,000 lives have been saved. That’s a great record. They save lives by patrolling our popular beaches on the weekends during the summer swimming season, usually between 9.00am and 5.00pm. Often they have a tower or a balcony they can sit in, so they can see out over the beach and over the water. 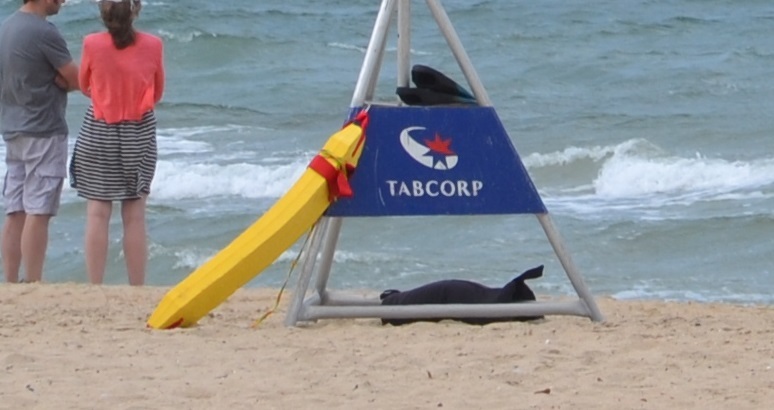 They encourage swimmers to swim between two flags which they place on the beach. These flags show where it is safe to swim. Swimmers who swim between the flags can be sure that someone is watching them. Should a swimmer get into trouble while in the water between the flags, surf lifesavers will come to their rescue. Surf lifesavers can use different methods to help the swimmer get back to shore. The lifesaver can swim out and help the swimmer back to shore using a special side swimming stroke. This swimming stroke allows the lifesaver to keep the swimmer afloat and their head above water. Often, the lifesaver can also bring with them a special rescue tube when they swim out, which they can wrap around the swimmer to keep their head above water. Lifesavers can also paddle out to the swimmer kneeling on a rescue board, which the swimmer can then grab onto to keep afloat. In 2012/13, this was the most frequent method used by surf club lifesavers to rescue swimmers in trouble. Finally, the lifesaver can use an inflatable rescue boat with a small outboard motor. These small boats are light, fast and agile when used in the surf, even when the waves are quite large. These boats can also carry a second lifesaver and are able to pick up more than one swimmer if required. Surf lifesavers need special training in order to handle these small boats. Once the swimmer is brought ashore, the surf lifesavers are also able to resuscitate the swimmer if that is required. Resuscitation may be required if a swimmer is not conscious, is not breathing or perhaps their heart has stopped. This means that, to be a surf lifesaver, you will need to be well trained. Once you turn 15 years of age, you can take a course called the Bronze Medallion. Passing this course will allow you to be part of the beach patrol and beach rescue service as a surf lifesaver, once you have joined a surf club. A pre-requisite for this course is the requirement to swim 400 metres in deep water, within 9 minutes. I think you would need to be fit and a strong swimmer to do that. That sounds right too. You couldn’t rescue someone in the surf if you weren’t a strong swimmer yourself. In the Bronze Medallion course, you cover a lot of topics including how to be safe in the surf, understanding the human body, basic first aid, rescue techniques and resuscitation techniques. The Bronze Medallion lifesaving course takes around 45 to 55 hours. As well as learning all these lifesaving skills, surf lifesavers love to compete against one another in special competitions held at the beach. These skills including distance running on the sand, beach sprints, swimming, rescue board races, surf boat races and many, many more. These competitions are great to watch and are even shown on television. They are called surf carnivals. I can remember the surf carnivals when I was growing up in my home town of Bunbury. Of course, by competing in these events, our surf lifesavers are getting stronger, faster and better at saving lives at the beach, as well as having fun at the same time. If you come to Australia in the summer and go to the beach, make sure you always swim between the red and yellow flags. They are the colours of Australia’s surf lifesavers. That’s the safe way to swim at the beach in Australia. If you have a question or a comment to make, please click on the comments link at the top of this page. Or, you can send me an email at rob@slowenglish.info. I would love to hear from you. Tell me where you live, a little bit about yourself and what you think of my Slow English podcast. I will write back to you, in English of course. Perhaps you could suggest a topic for a future podcast. If you would like to take a short quiz to see if you have understood this podcast, you will also find it on my website. Goodbye until next time. Podcast 32 Quiz - Did you understand the podcast? True or False? – People started swimming at beaches in Sydney in the early 1900s. True or False? – The first surf lifesaving club was started in 1907 and now there are 311 surf lifesaving clubs in Australia. True or False? – Surf Life Saving Australia is the largest group of volunteer life savers in the world. True or False? – If you swim between the flags, you know that it is safe to swim there. True or False? – The most frequent method used to rescue swimmers is the inflatable rescue boat. True or False? – Once a surf lifesaver has brought a swimmer to shore, they are also able to resuscitate them if required. True or False? – After joining a surf life saving club and passing the Bronze Medallion, a surf lifesaver can be part of a beach patrol. True or False? – Before you can pass the Bronze Medallion, you must be able to swim 400 metres in more than 9 minutes. True or False? – Surf lifesavers like to compete against one another in such skills as beach sprints and rescue board races. pre-requisite = when something is needed before you can do something else. rules = things which you must obey. For example, no faster than 60 kmh. Thanks for your recent podcast. It was as interesting as usual. The Surf Life Saving organisation in Germany is called DLRG (Deutsche Lebensrettungs-Gesellschaft). It was founded in 1913 after a disaster on the island Rügen (Baltic Sea) in 1912. Over 1,000 people were waiting on the pier of Binz for the steamer “Kronprinz Wilhelm”. The end of the pier collapsed and nearly 100 people fell into the Baltic Sea. For 14 people, including two children, any help came too late. It was reported that it was a shame that hardly anyone of the countless people on the pier and on the steamer was willing or able to help, to give the victims first aid or to resuscitate them. At this time about 5,000 people drowned each year in Germany and only 2-3% of the population could swim. Nowadays about 80% of the German population are able to swim. Lifesavers control the German beaches (North and Baltic Sea), lakes and rivers from Mai to September. In most of the baths they are also responsible the safety of the swimmers. At the end of 2012 this organisation had about 550,000 members (42% children younger than 14 and 20% young people from 14 to 26 and the rest of course older than 26). Most of the members are volunteers, too, only a few people are paid. Thanks for your comment. Your summary of the German experience in life saving is very interesting. The DLRG is obviously very similar to the Surf Life Saving Australia organisation and it’s membership is very impressive. Your country has made huge advances in teaching people to swim. Our own Royal Life Saving Society in Australia is trying to ensure as many people as possible learn to swim to a good standard. Even so, there were 291 drowning deaths in Australia in 2012/13. Hi Ray. I certainly enjoyed visiting the great little beach at Port Melbourne as part of my research.